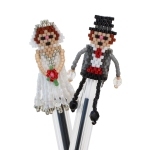 The Bride and Groom Pen Topper makes a quick but quirky and special beaded wedding gift for your friends or family. They have been been made to fit on a medium crystal bic biro – however the pattern can be easily modified to use with many different types of pens. As you twirl the pen, the Grooms's arms and legs move whilst the brides dress flares out They will be sure to amuse the recipient of the pen. Why not customize the toppers and choose hair and accent colours that match the wedding colours of the intended recipient. These Pen Topper bead patterns are made using Japanese Miyuki size 11 Delica beads and Brick Stitch is used. It is assumed the beader will be familiar with Brick stitch. Brick stitch bead instructions are available free on www.threadabead.com. Please note the pattern may not work with any other size and type of beads. There are 11 colours in total and each finished beadwork is approximately 2.25cm x 4.5 cm. 18 x 3mm crystal AB, 2 x 4mm crystal AB and 2 x 4mm jet firepolished crystals are also required. The bead pattern supplied is 16 pages and includes a colour chart of suggested delicas, a colour pattern and a numbered coloured pattern.